In the early church every believer was expected to worship God every day, both in private and in the company of other believers as they gathered together for common meals. This did not require a “worship service”; it only necessitated a commitment to feel the awe of God’s magnificence, to express gratitude for His love and authority, to acknowledge His control and power, to follow Him with dedication, and to enjoy the miracle of His relationship with us. We are called to share His love with those who have not yet understood it or embrace it. It is natural to talk about and promote the things that excite us. Nothing should excite us more than the realization that God Himself loves us, wants an intimate relationship with us, and allows us to invite others into that sacred and priceless relationship with Him (see: 1 John 1:1-4). The evangelistic efforts of the first believers were carried out through preaching, low-key/high-impact conversations about truth and purpose, prayer, performing miracles to foster the opportunity to discuss the Source of their power and the joy-filled perspective they had toward God and life that created interest in their lives. The Church in Jerusalem endeavoured to learn more about the Christian faith and employ the principles of Jesus’ teachings. Believers exhibited a remarkable attitude toward life and people and acknowledged the presence of the supernatural in their everyday adventures. They placed their faith at the center of their lives and derived their sense of meaning, purpose, and direction from their connection to God and His commands. Love is more than a feeling; it is a tangible reality when it is shared with other people through acts of selfless service. The early Church fostered the notion that serving the people was the best means of demonstrating the example that Jesus had set for them. Servanthood also showed the transformation that their faith had wrought within them. Like Christ, they lived to serve rather than to be served. Because we own nothing in this life, it is best to wisely invest the resources we manage for the One who is the true owner of all things. The first Christians defined communal living through their sacrificial sharing of everything they had. Note that the Scriptures specifically tell us that they shared “everything” with those in need, and that they used the variety of resources at their disposal – money, food, clothing, housing, relationships, influence, skills, time – for the benefit of all believers. The Church was all about relationships. These friends of Jesus became friends with each other and revelled in their mutual admiration of Christ in their frequent get-togethers. The friendships they formed provided not only encouragement but also loving accountability for spiritual integrity. Christian families taught the ways of God in their homes every day. Parents were expected to model a Spirit-filled, Spirit-led lifestyle for their children, and families were to make their home a sanctuary for God. In a very real sense, the home was the early church – supplemented by larger gatherings in the Temple and elsewhere, but never replaced by what took place in the homes of the believers. These are the features that revolutionaries today are seeking for in any church that they might choose to attend. Ralph’s teaching begins at the 50 min mark if you would like to move it forward. Those who are revolutionary in their faith – those in our world whose faith is transforming the way they live and express their faith – will often be judged and dismissed by those who are not on the same journey to discovery. Often their beliefs and life-style will be judged and rejected as not in full compliance with Scripture. However, every person who embraces the name Christian and seeks to live in ways that honour Jesus Christ must be careful with their judgments and criticisms. We must evaluate everything in light of what the Bible teaches and not what we think it says and reveals, what we are comfortable and feel secure in. Often, in our judgments we end up with more opinion than Scripture. God said to Peter, “Do not call something unclean if God has made it clean” (Acts 11:9). So, we must be careful not to judge and reject the journey that others are on – especially the revolutionaries – just because it does not fit our understanding or the place we are at on our own personal journey with Jesus. We must be very careful how we critique another person’s journey. If someone’s path conforms to correct biblical guidelines – even though it may stray from church traditions, cultural expectations, or our personal comfort zone – then we must accept the possibility that God may be working through him or her in a manner that is different from how He is working through us, or perhaps different from the ways we have previously seen or experienced His leading. We are called to be wise and discerning, but not judgmental. In other words, we are not called to judge the spiritual path of other believers who are dedicated to pleasing God and blessing people when the root of our concern is their style or approach, even though they are true to biblical principles and commands. We are to be discerning in our observation of how fellow believers connect with God and respond to His exhortations, and sensitive to the latitude He has allowed us within the boundaries of Scripture. Since the Bible is the source of motivation and wisdom in our efforts to be more Christlike, let’s examine the key biblical passages regarding the nature of the Church – that is, the aggregation of followers of Jesus Christ whom He has saved. The most pertinent passages are in the book of Acts, which describes the life of the early Church, immediately after Jesus returned to Heaven and allowed the leaders He had trained to develop the Church. Acts 4:24, 31-35 “And when they heard it, they lifted their voices together to God and said, “Sovereign Lord, who made the heaven and the earth and the sea and everything in them…And when they had prayed, the place in which they were gathered together was shaken, and they were all filled with the Holy Spirit and continued to speak the word of God with boldness. These passages tell us what the revolutionaries today are working to reclaim and become directly involved in. This is what revolution is all about: making it possible to live in such a way, in connection with other like-minded people, that the description we just read is not merely an artifact of Christian history, but a depiction of our Christian experience today. Those who are part of the current move of the Holy Spirit – the ones I have been calling the “revolutionaries” in the Church that Jesus is building – have no use for churches that play religious games, whether those games are worship services that drone on without the presence of God or ministry programs that bear no spiritual fruit. Revolutionaries eschew ministries that compromise or soft sell our sinful nature to expand organizational turf. They refuse to follow people in ministry leadership positions who cast a personal vision rather than God’s, who seek popularity rather than the proclamation of truth in their public statements, or who are more concerned about their own image and/or legacy than that of Jesus Christ. Revolutionaries refuse to donate one more dollar to man-made monuments that mark their own achievements and guarantee their place in history. They are unimpressed by accredited degrees and endowed chairs in Christian colleges and seminaries that produce and graduate young people incapable of defending the Bible or unwilling to devote their lives to serving the Lord, His people, and the lost. And revolutionaries are embarrassed by language that promises Christian love and holiness but turns out to be all sizzle and no substance. However, many revolutionaries have been active in good churches that have biblical preaching, people coming to Christ and being baptized, a full roster of interesting classes and programs, and a congregation packed with nice people. There is nothing overtly wrong with anything taking place at such churches. But revolutionaries innately realize that it is just not enough to go with the flow. The experience provided through their church, although better than average, still seems flat. They are seeking a faith experience that is more robust and awe inspiring, a spiritual journey that prioritizes transformation at every turn, something worthy of the Creator whom their faith reflects. They are seeking the spark provided by a commitment to a true revolution in thinking, behaviour, and experience, where settling for what is merely good and above average is defeat. Revolutionaries zealously pursue an intimate relationship with God, which Jesus Christ promised we could have through Him. They recognize that there is a huge price to pay in their lifetime – and they are mindful of the eternal payoff as well. Faced with an abundance of options, revolutionaries make their decisions with great care, knowing that each choice matters to God. In the Church today in many nations, the easiest thing to get away with is going with the flow and not upsetting the boat in any way. The ride is smoother and resistance is minimized. But like the wide path that Scripture warns most believers will take, it is a comfortable route that eventually and inevitably results in disaster and disappointment. To the revolutionary, there is no such thing as “going along to get along.” You either stand for Jesus or you stand for all that He died to repudiate. Revolutionaries invariably turn to God’s Word – the Bible – for their guidance as they examine their own spiritual life and the life of the Church. And, they are aware of the fact that just as the prophets of old were unwelcome in their own home town, so are revolutionaries looked at askance by even their closest friends and family members. The skepticism of those who lead conventional spiritual lives is a palpable reminder that growth always comes with a price tag as does following Jesus. Be forewarned: just as Jesus Christ, the ultimate lover of humanity, was scorned, misunderstood, persecuted, and eventually murdered for His extreme love, goodness, compassion, humility, wisdom, and grace, so are revolutionaries abused by a culture and the Church that is itself in crisis. The mere presence of revolutionaries makes the typical church and churchgoer uncomfortable. It is not uncommon for revolutionaries to meet with rejection – verbal, intellectual, relational, or experiential – simply because of their determination to honour the God they love. Are you a revolutionary? Is someone in your family or your circle of friends a revolutionary? Would you like to be a revolutionary – someone who lives only to love, obey and serve God, rejecting and overcoming every obstacle that emerges to prevent such a life? We were talking about a revolution… a quiet revolution that is shaking the Church. You won’t read about it in the print media or hear about it on cable news. Few are talking about it publicly. Apostles are talking about it on a regular basis but, in spite of that, Christian churches are only vaguely aware that something seems different. They have little idea what the shaking is all about or that there is even a shaking happening. The Church has entered the revolutionary age. We have had the information revolution, the technological revolution, the sexual revolution, the globalization revolution, the Nintendo revolution, the green revolution, the entrepreneurial revolution, the conservative revolution, and on the list could go. It is amazing that most people, including believers, are totally unaware of the most important revolution of them all: the spiritual revolution that is reshaping Christianity, personal faith, corporate religious experience, and the moral contours of nations. Webster’s Dictionary is aptly describing the transformation occurring in the lives of many people, churches, and even nations in the spiritual realm today. Millions of devout followers of Jesus Christ are repudiating tepid systems and practices of the Christian faith and introducing a wholesale shift in how faith is understood, integrated, and influencing the world today. Because human beings become what they believe, and practicing what they believe is the swiftest and surest means of generating lasting change, this revolution of faith practices is the most significant transition we will experience during our lifetime. One of the hallmarks of this period in history is the unprecedented busyness of people’s lives. More responsibilities and distractions bombard the typical believer’s life than we could have imagined possible just a century ago. It is in the midst of this cultural context – a society defined by seemingly infinite opportunities and options and supported by a worldview best summarized by a single word: ‘whatever’ – that this countercultural, faith-based response and revolution has emerged. In reality, our culture’s inability to provide fulfillment has caused millions of individuals – who are serious about understanding their existence and living right – to live in a manner that never fails to raise eyebrows in a society that is notably shockproof and dispassionate. These people have chosen to live in concert with core biblical principles. That strategic choice makes them stand out as extremists in a culture that keeps pushing the boundaries of extremism. These are the Christian revolutionaries. What makes revolutionaries so startling is that they are confidently returning to a first-century lifestyle based on faith, goodness, love, generosity, kindness, simplicity, and other values deemed “quaint” by today’s frenetic and morally untethered standards. This is not the defeatist retreat of an underachieving, low-capacity mass of people. It is an intelligent and intentional embrace of a way of life that is the only viable antidote to the untenable moral standards, dysfunctional relationships, material excess, abusive power, and unfortunate misapplication of talent and knowledge that pass for life in most countries, societies and church structures today. Many who are making revolutionary changes in what they believe and how they live out their beliefs have tested the alternatives and found them to be woefully inadequate. Now, they have gratefully and humbly accepted the opportunity to do what is right, simply because it is right, even if it is not original or culturally hip. The unfortunate truth is that most believers and non-believers alike are mired in an agonizing revolving door of trial-and-error efforts in a disheartening and unfulfilling search for truth, integrity, meaning, wholeness, connection, passion, and inner peace. Being in the presence of people – the revolutionaries – who seem to have discovered the keys to achieving such lofty and desirable outcomes cannot help but cause earnest seekers to take notice – and to wonder how it is even remotely possible for ‘revolutionaries’ to succeed in this sophisticated age with such simple values and practices. The Church is being shaken and those who are hungry for truth and want to be involved in what God s doing today in the Church that He is building are joining the ranks of the revolutionaries. Some remain within the traditional structures of the Church and others do not. In the history of the Church we see churches that are birthed believing that saving the lost is the key. Telling others the Gospel of the Kingdom is part of the DNA of the church as it begins, grows, multiplies, and occupies until Jesus returns (xxxx). People are born again, discipled, trained and equipped. They are released and begin to minister to the world in which they live. We see true disciples of Jesus making disciples (Matthew 28:19). It is simply amazing and biblical. However, it does not take more than a generation before the zeal for the lost and the call upon every believer to “go into al the world and make disciples” slowly ebbs and eventually disappears. Then we see a church without purpose or passion. Eventually, some of the members of the church catch the spark and decide to obey what the Scriptures state and Jesus commands. However, these few who are passionate and even zealous about reaching the lost, the least, and the last are not understood and are not welcomed by the majority in the local church. The majority are comfortable, safe, and secure and do not want to be disturbed mentally, spiritually, physically, or relationally. In their minds things are good and don’t need to be changed. On a dangerous seacoast where shipwrecks often occur there was once a crude little lifesaving station. The building was just a hut, and there was only one boat, but the few devoted members kept a constant watch over the sea, and with no thought for themselves went out day and night tirelessly searching for the lost. Many lives were saved by this wonderful little station, so that it became famous. Some of those who were saved, and various others in the surrounding area, wanted to become associated with the station and give of their time and money and effort for the support of its work. New boats were bought and new crews trained. The little lifesaving station grew. Some of the members of the lifesaving station were unhappy that the build­ing was so crude and poorly equipped. They felt that a more comfortable place should be provided as the first refuge of those saved from the sea. So they re­placed the emergency cots with beds and put better furniture in the en­larged building. Now the lifesaving station became a popular gathering place for its members, and they decorated it beautifully and furnished it exquisitely, because they used it as a sort of club. Fewer members were now interested in going to sea on lifesaving missions, so they hired lifeboat crews to do this work. The lifesaving motif still prevailed in this club’s decoration, and there was a liturgical lifeboat in the room where the club initiations were held. About this time a large ship was wrecked off the coast, and the hired crews brought in boatloads of cold, wet, and half-drowned people. They were dirty and sick, and some of them had black skin and some had yellow skin. The beautiful new club was in chaos. So the property committee immediately had a shower at house built outside the club where victims of shipwreck could be cleaned up before coming inside. At the next meeting, there was a split in the club membership. Most of the members wanted to stop the club’s lifesaving activities as being unpleasant and a hindrance to the normal social life of the club. Some members insisted upon lifesaving as their primary purpose and pointed out that they were still called a lifesaving station. But they were finally voted down and told that if they wanted to save the lives of all the various kinds of people who were shipwrecked in those waters, they could begin their own lifesaving station down the coast. They did. As the years went by, the new station experienced the same changes that had occurred in the old. It evolved into a club, and yet another lifesaving station was founded. History continued to repeat itself, and if you visit that sea coast today, you will find a number of exclusive clubs along that shore. Shipwrecks are frequent in those waters, but most of the people drown! The Church that Jesus is building will be one noted for an extreme and powerful love. A practical, every day, hands-on love for each other within the fellowship. And, a love for those not yet part of the family and thus unsaved. The truth is, conflict cannot be avoided in real community. It is not only a part of life; it is especially a part of life together. The only place where people are together and conflict does not exist is the cemetery. There is nothing in the Scriptures that suggests we are to deny or avoid conflict. Quite the opposite, actually. Instead of being admonished to avoid it, God’s Word tells us that we are to expect it and also how to handle it. Conflict is not a sin, but all sin leads to conflict. The Bible encourages us to lean into our relational troubles. It is shocking how conflict avoidance is what often takes place which results in wounded, inauthentic relationships. As a result, the biblical call to unity and oneness as well as the call to be ministers of reconciliation is not answered. Instead of being examples of forgiveness, unity, and love we bear the fruit of shallow relationships and fractured friendships. We talk a lot about our love for and commitment to one another, but we seem to struggle to demonstrate these things when they require forbearance, humility, forgiveness, and selfless communication in moments of awkwardness or conflict. Simply put, we are awkward in our handling of the awkwardness between us. This is taking a toll on people’s willingness to come to our churches. And, those who are attending do not experience the fullness of what Christ wants for them in the Church. The Barna Group found that some of the main reasons people avoid church are the painful experiences they have endured within a local church context. The article noted that among unchurched adults, nearly four out of every ten non-church going Americans said they avoid churches because of negative past experiences in churches or with church people. People around us are offended because the people within our church body are not fully devoted to all that Christ’s Word teaches us about dealing with offences. And, they do not see the love that Jesus said we are to have for one another. This lack of conflict resolution is sad. The resulting lack of trust results in surface relationships where people are no longer willing to share anything personal or anything that is important with others in the church. So, in the long run everyone suffers – not just the few who are in conflict. This is really sad as it is in the Church that the world should be able to come, learn, and watch people from every tribe, nation, gender, and socioeconomic stratum live in peace with one another. Not without conflict as there will always be conflict when people and churches are growing and moving forward in the things of God. But, in the midst of conflict, seeing believers deal with each other in a loving, forgiving, and reconciling way. I am involved in a local church as the trans-local apostolic overseer. For the past few years there has been a great deal of conflict. It started between leaders – but did not remain there. It started over small misunderstandings – but soon grew into major proportions. It started with people assuming things and not checking out their assumptions. Near the time went the eldership was dissolved many had been defiled by individuals on the eldership speaking to others instead of to each other. At the end, as announcements were made that two of the elders and their families were leaving the church, others had already left and others would soon leave because of the gossip and back-bitting and actual politicking of the elders who were leaving. In fact, I was aware of the talk and defilement that was being spread as one of the elders told me five months before he left that he was already telling others that he was planning to leave. From the beginning of my involvement in the conflict I kept say, “Just go talk with each other and sort things out.” But, because those who were on the eldership were all “friends” they did not want to upset each other. Of course, what I shared at that point came true. By not sharing and dealing with issues you will destroy the ‘friendship’ or relationship that you do have. And, that is what has happened. Oh, as they announced they were leaving they commented on how much they love the church – yet, even after leaving, they continue to speak against the leader and some of the new leadership. That is not love no matter which way you slice it. It is time that we learn how to build the Church in such a way that it is a safe place to have decent, in-depth relationships. It is time to learn how to really love one another. It is time to learn how to seriously forgive each other and deal with offences. It is time that we learn how to humble ourselves and move forward past the relational conflicts and resulting woundedness. 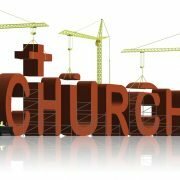 It is time to be the Church that Jesus is building.